Rose quartz transmits a soft love energy, which is soothing and calming to the emotions. The vibration or resonance signature of rose quartz is good if a person has been assaulted in any way. It is wonderful to use in mid-life crisis when dissolution of old patterns and reassessment is imperative. The paler the rose quartz goes colourwise, the wider, higher and deeper the love vibration extends. The very pale natural rose is highly tuned and sensitive; it carries the promise of spiritual fulfilment. 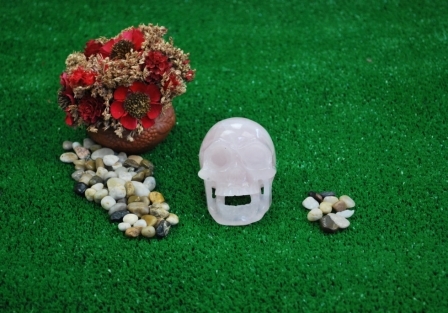 Rose quartz is very good for children, the newborn and those yet to be born. It is also ideal for those who are giving birth to their inner child or any new venture; the red within the pink activates the energy, while the white spiritualises the endeavour. Rose quartz can fully balance the emotional body. It is used to attune to the love vibration. The rose quartz ray works dynamically on the heart chakra, gently cleansing and then transmuting all stored putrefied negative issues of self-worth, self-confidence and self-acceptance. It contains within its beautiful pink mandala the ray of hope.